1. The aged care person no longer understands when it is safe to answer the door and will let in people who could take advantage of them. 2. Valuable items are noticed missing from the house and when asked by family members and the aged person not able to remember where those items are. 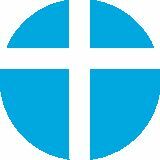 ď&#x201A;ˇ Nutritional care In case, if an elderly person neglects to feed themselves or skip meals then the nutritional needs of that person are not being met. That is the main reason why nursing homes are so important because there are three meals provided every day. Take food on time is important for an older person to keep the weight on, and to prevent disease. Once they start to skip their meal, nutrition is lacking and it will affect their skin and their general health. ď&#x201A;ˇ Basic needs Regular living needs are important for an elder person from waking up and having a shower to dressing having breakfast, washing clothes, cleaning the house and much more. When those basic needs can no longer be met then Nursing home is able to give help to their residents. The lifestyle coordinator is there to arrange such requirements as cleaning, feeding washing clothes and assisting with daily needs. 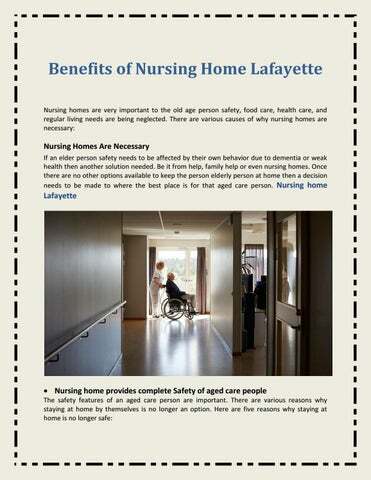 Once the person enters a stage where they are not able to live safely themselves and forger their day to day living needs, at that point, Nursing home Lafayette is must.